My regular readers are well familiar with my obsession with farmers’ markets and the marketing lessons harvested therefrom. But this week’s marketing lesson from the Farmer’s Market about the value of giving a little away to draw more business later on – couldn’t be more timely in light of my upcoming FREE Webinar, Seven Figure E-book . But first, more on the Farmer’s Market. The picture accompanying this post shows the table of samples that’s laid out week after week at the most popular produce stand at my local farmer’s market. And it’s the sample table that accounts for the stand’s popularity even though there are at least six other stands with similar products. Here are a couple of reasons that free samples can draw paid business – and why the same tactics can work for law firms. Samples demonstrate the quality of the products to potential buyers. Though it’s easy to post signs or awards attesting to farming practices or produce quality, buyers want to know one thing: how the fruits and vegetables are going to taste. Free samples answer that single question. The same goes for lawyers. Blog posts, articles, and other smart content show rather than tell potential clients what you do. One caveat: as you can tell from the photo, the Farmers’ Market samples are fresh and colorful. Samples that are bruised or rotten wouldn’t serve much purpose and indeed, could potentially drive customers away. The same holds true for lawyers who give away free content: dispensing mass-produced, generic pablum isn’t a great way to put your best foot forward. Free content will only attract buyers if it’s solid work that accurately reflects your firm’s capabilities. Samples educate consumers about options they weren’t aware that they had. On several occasions, I’ve tasted a new variety of fruit like a pluot or a Gold Rush apple at the sample table and enjoyed it so much that I made a purchase – not just that week, but on a regular basis. Free content for clients works the same way. Many times clients may not realize that a particular harm that they’ve suffered may entitle them to a remedy. Before I published the E-book that drove seven figures in revenue to my firm, most prospective clients didn’t realize that they could actually oppose a pipeline or re-route it off their property. If you’ve informed clients of a potential right or helped them to preserve it, chances are they’ll bring their case to you when they’re ready to move forward. Samples are exciting. Let’s face it, who doesn’t love a freebie? The folks who come around to the sample table may not buy the first time, but at some point, they’ll reward the seller’s generosity with a purchase. In many cases, the free samples excite kids the most – and I’ve frequently seen kids urge their parents to buy a dozen apples or a carton of berries because they liked the sample so much. Free content can excite potential clients – but also, keep in mind, that free content attracts more than the ultimate consumer. Just as free samples at the farmer’s market appeal to children who will then persuade their parents to make a purchase, strong content may attract someone other than the client – perhaps an attorney with a case to refer or the children of an elderly disabled widow who will then persuade the eventual client to make the hire. 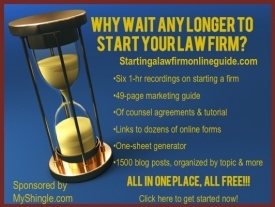 At least forty percent of the seven figures of business that I earned from my ebook came directly from referring attorneys who either directed clients to my firm or hired me directly as co-counsel. Lawyers are notoriously stingy; fearful of giving away content, worried that clients won’t hire them if they can figure out what they need to do on their own or that others will steal or copy the content. And these are valid concerns – just as vendors take a risk of giving away a few hundred dollars worth of free fruit without ever making a sale. But the risk of losing a few potential clients by giving away content is outweighed by the number of clients that free content can help to attract. In other words, sometimes you need to give a little in order to get a lot more.